Tintin, a young reporter, buys a model ship called “the Unicorn” at a local market in a European town (probably Belgium). Two men interrupt Tintin a few moments later and attempt to purchase this ship from him. He refuses. Soon he is threatened, attacked, and kidnapped, and the model ship stolen. Aided by his dog Snowy and a less-than-sober Captain Haddock, Tintin embarks on a quest to get to the bottom of the Secret of the Unicorn. I had reasonably high expectations for The Adventures of Tintin. After all, with Spielberg at the helm, aided by such trusty folks as John Williams (composer), Peter Jackson (producer), Weta (visual effects), Andy Serkis (Captain Haddock), and Daniel Craig (Red Rackham) the movie might have been spectacular. But for whatever reason, I didn’t think it was spectacular. One thing I did not like about The Adventures of Tintin is that it felt too much like Spielberg was trying to make Indiana Jones for kids. While the Tintin comic books are as full of cliffhangers as any of Harrison Ford’s movies, the suspense is different. Indiana Jones could be killed. He could be shot, his family members could die, and those he loved could perish. In Indiana Jones, the audience is constantly asking the question, “Will Indiana escape?” In the Tintin comic books, the question is never “will Tintin escape?” The question is always “how will Tintin escape?” The movie (in my opinion) makes the world of Tintin come a little too much to life—it’s so realistic visually that the exaggerated escapes of Tintin and the slapstick humor of Thompson and Thomson no longer fits. However, the cinematography is great (yes, even in old-fashioned two dimensions)—there are long sequences of beautifully detailed, continuous action that take the audience through the bowels of a freighter, through a bleak desert, and through the streets of Bagghar. All the characters seem to flit between photorealistic and cartoonish—in some scenes the movie looked (to my eyes, anyway) like it had been filmed live-action. Another thing that is refreshing is that The Adventures of Tintin is a simple “good guys, bad guys” kind of story. Tintin isn’t a dark anti-hero. He’s not a protagonist carrying a freight-load of faults on his back. He’s just a simple, up-right reporter trying to get to the bottom of a mystery. 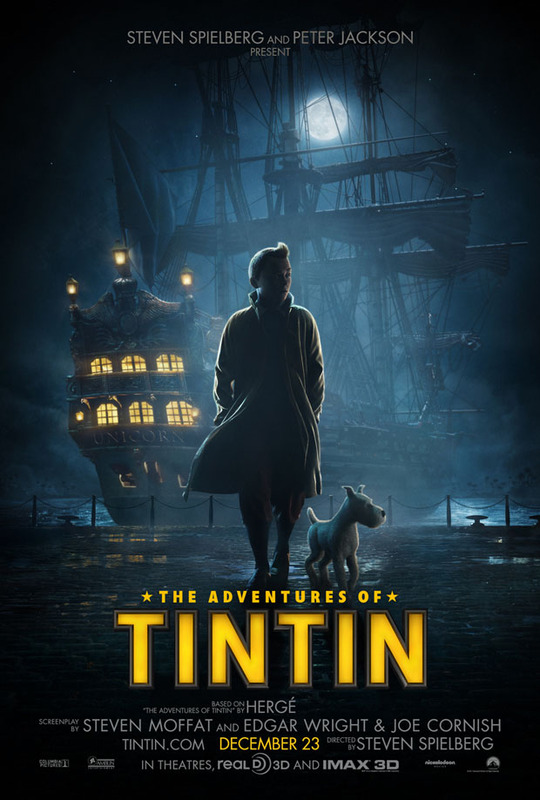 The lack of profanity, bedroom scenes, and exorbitant amounts of violence means that Tintin, unlike many modern films, is a great movie for the whole family.